Learning the Art of Home Spinning and Weaving! There are many ways to go about learning a new craft! The easiest and clearest way, with all of the essential details, is by far the favored method! A how-to manual, with nothing important left out, is your first step toward success! Special Ideas for Your New Craft! However, when you put just a little thought into it, you may have some reservations. You may be concerned that it will take a long time to learn, or that you will need to put more money into materials you cannot really afford. You may be wondering if the time and effort you put into it will be worth the effort-- if you will truly be satisfied with the results you create! Please do not order supplies, or rush into trying your hand at this craft, without first reading this ebook! 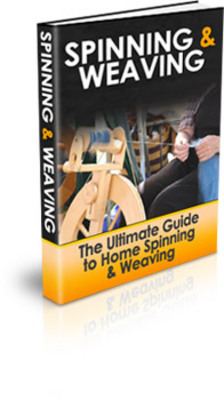 It can save you valuable time and money, as well as give you all of the information you need to begin learning how to spin and weave in your own home!